Orimolade signed with the National Football League’s Los Angeles Rams as an undrafted free agent on May 2, 2017. He attended training camp with the Rams and was waived on Sept. 2, 2017. 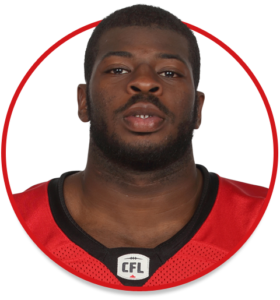 (Calgary) Orimolade made his CFL debut in Week 3 against Ottawa and appeared in a total of 10 regular-season games during his first season with the Stamps. He accumulated seven defensive tackles, 10 special-teams tackles, two sacks, two forced fumbles, one fumble recovery and one knockdown. Orimolade was also in uniform for both post-season games and had two special-teams tackles and one fumble recovery in Calgary’s Grey Cup victory. Orimolade played 39 games at linebacker over four seasons (2013-16) at Dartmouth. He recorded 143 total tackles including 35 tackles for loss and also accumulated 23.5 sacks, 10 forced fumbles and eight pass breakups. The career sack total was second highest in Big Green history. He was the Ivy League’s defensive player of the year in 2016 and was a finalist for the Buck Buchanan Award as the best defensive player in Division I after recording 83 tackles including 14.5 tackles for loss, nine sacks, five forced fumbles and three pass breakups. Orimolade was a senior captain at James Hubert Blake High School in Silver Spring, Md., playing on both the offensive and defensive lines. His full name is Adefolarin Adebayo Orimolade.